Microsoft’s Internet Explorer 7.0 team detailed the CSS/Web Standards changes that are being made and also discussed the Web Standards Project’s participation. Google just announced a new Google Base data API. This is significant for developers. Will be interesting to see what happens becaus of it. Thanks to Richard MacManus for letting us know. Now we know why they hired Vic Gundotra. You can see that Google is going to build a whole developer program. Diego Rodriguez writes about how General Motors is using Flickr. Here’s one thing I learned from Thomas Hawk, though. He says if you want a lot of traffic from Google Images that you have to upload your images using Google’s Picasa instead of to Yahoo’s service. Sounds like Google is penalizing Flickr, right? Well, probably not explicitly Thomas told me. Instead Google’s algorithm biases on URL names. So, if you are searching Google Images for “Cool Cars” then Google will bring back images with the name in the URL. Picasa, when it uploads, includes the file names you give your photos in the URL. Flickr changes those to numbers. 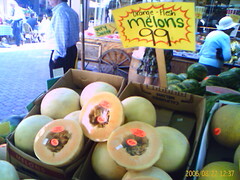 Oh, and the melons? They were in the Stanford Mall today. Nice melons, huh? Heheh. I just wanted to write a post with a cool car photo in it.